Description: A 5-7.5mm long bronze brown Amara. Found on sparsely vegetated, sandy soils, usually near the coast. Phytophagous. Very local. World Distribution: A European Wide-temperate species (63) found across Europe to the Caucasus and western Turkestan. Irish Status: Coastal. Widespread but rare and perhaps declining. 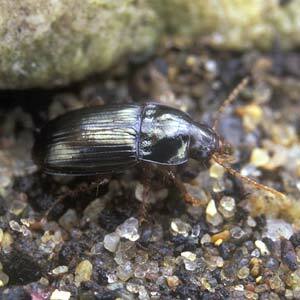 Ecology: A xerophilic species and not very common anywhere in Ireland. Mostly recorded from lightly vegetated sandy soils near the east and south coasts.